is the name of the date 15 March in the Roman calendar. The term ides was used for the 15th day of the months of March, May, July, and October, and the 13th day of the other eight months. In Roman times, the Ides of March was a festive day dedicated to the god Mars and a military parade was usually held. 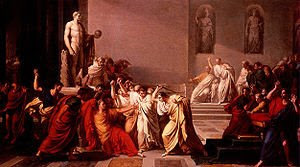 In modern times, the term Ides of March is best known as the date that Julius Caesar was assassinated, in 44 BC, the story of which was famously dramatized in William Shakespeare's play Julius Caesar. The term idūs (ides) is thought to have originally been the day of the full moon. The Romans considered this an auspicious day in their calendar. The word ides comes from Latin, meaning "half division" (of a month). Caesar was assassinated on the Ides of March, 44 BC, after declaring himself dictator of Rome for life. "Beware the Ides of March,"
has forever imbued that date with a sense of foreboding. But in Roman times the expression "Ides of March" did not necessarily evoke a dark mood—it was simply the standard way of saying "March 15." Surely such a fanciful expression must signify something more than merely another day of the year? Not so. Even in Shakespeare's time, sixteen centuries later, audiences attending his play Julius Caesar wouldn't have blinked twice upon hearing the date called the Ides. The remaining, unnamed days of the month were identified by counting backwards from the Kalends, Nones, or the Ides. For example, March 3 would be V Nones—5 days before the Nones (the Roman method of counting days was inclusive; in other words, the Nones would be counted as one of the 5 days). Die Iden des März (von lateinisch Idus Martiae) sind eine in vielen Sprachen gebräuchliche Metapher für bevorstehendes Unheil, die auf die Ermordung Gaius Iulius Caesars am 15. März des Jahres 44 vor Christus Bezug nimmt. (deutsch: „Hüte dich vor den Iden des März“). I remember having the strictest history teacher known to man, Gabi. Yet it was her who inspired me to get one of my degrees in History with specialties in Russia and the French Revolution. Thank you, Gabi, for stimulating this remembrance. ides of march . . .